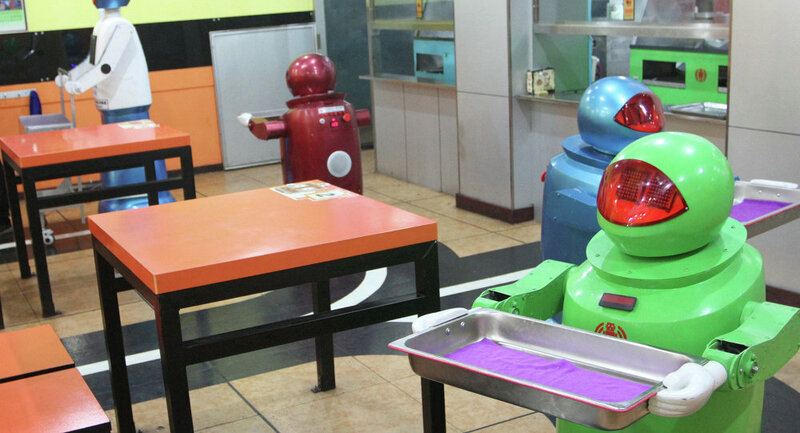 The first restaurants staffed with robotic waiters are expected to appear in Iran in the next few months. A team of engineers led by computer technology expert Ismail Mehrabi spent nearly a year designing robotic waiters, and the first restaurants with robotic catering staff may actually appear in the Islamic republic in just a couple of months' time. The robotic waiters will be fitted with an advanced audio system which will allow them to communicate with customers in several languages, Mehrabi told Mehr news agency. "These robots will be able to talk with customers and to express joy or displeasure via their ‘faces’. It will help create a friendly atmosphere between man and machine," he explained. The tables in such robo-restaurants will be fitted with tablet computers which customers can use to place their order. The clients will also be able to pay for their food via an online service. Mehrabi pointed out that similar ‘robotized’ establishments already exist in China, Singapore, Malaysia, the US and the UK, but robotic waiters in Iranian restaurants will differ from their foreign counterparts. "The machines in existing venues usually move along predetermined routes, whereas our robots will be able to plot an optimal path by themselves thanks to a special algorithm," he said. Weapons of the Future: Can Robots Replace Humans on the Battlefield?